The weirdest thing happened last night. I didn’t get up to go to the bathroom once! That never happens, and while you’d think I would be totally rested and refreshed I actually woke up really out of it. I have been in a daze all morning and it kind of felt like I had a mild headache. I lost track of what posture we were doing at yoga and almost rubbed conditioner all over my legs instead of lotion. Dare I say I PREFER to wake up at night? I won’t commit to that yet:) But yes I went to Bikram this morning since I won’t be able to go to my usual Wednesday morning class. It was actually a pretty easy class and wasn’t too hot which was perfect for my state of mind. I bought this strapless top at Aerie last spring and forgot about it! Wearing a sweater makes it more work appropriate, but still probably only okay for a casual office like mine. As I was walking out of the locker room in my office’s gym, I glanced to the right and my heart skipped a beat. TWO NEW TREADMILLS!! What used to be there was two of those ancient ones you see to the left, but with big “OUT OF ORDER” signs on them. They were like that for a good 7 months but I guess someone decided to do something about it. Inopportune timing with me leaving soon, but it’s nice to know I can actually get in a run at work if I need to. Time to get some work done in my FREEZING COLD OFFICE. It’s so bad today that even my co-workers are complaining. We have the temperature turned up so high, too!! Ughh, I hate being cold! I actually have a space heater at work…I have it on all the time. I feel like I can’t focus if I’m too cold! Yay for new treadmills! And Ilove that top! I am always cold. My feet especially. The only way I can warm them up..is by running them under warm water in the tub. Socks.. blankets.. just don’t cut it! I usually wake up once to go to the bathroom too, but haven’t the last bit. I am with you I feel off today, even after a good sleep – maybe I have the Mondays?! Luckily my current office isn’t as cold as some other places I’ve worked – I’m not lucky enough to have a casual dress code though! Funny, Experts say if you dont wake up to go to the bathroom atleast once throughout the night, the body is not hydrated… Hence why you probably woke up feeling as you did. Treadmills look sweet. You going to burn rubber on those bad boys????? My office is freezing too!! I’m thinking about keeping a blanket at my desk! 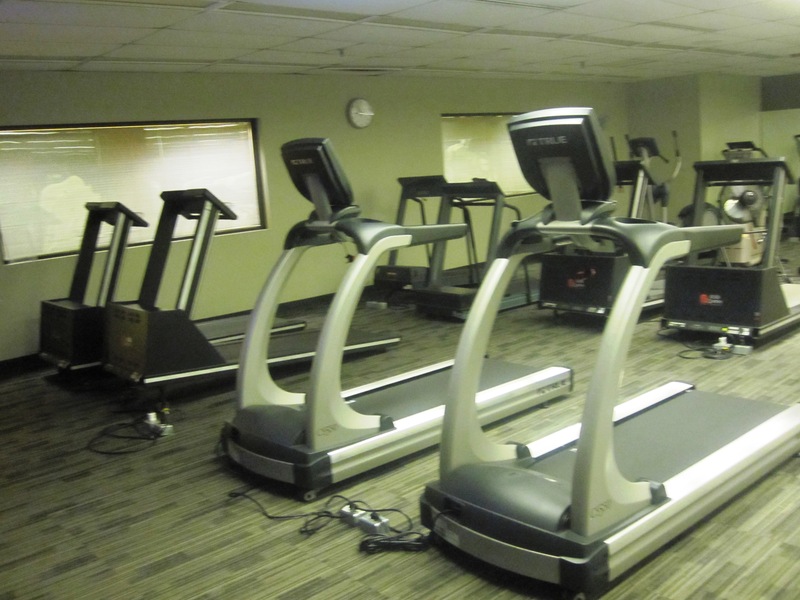 Love the new treadmills–they look so fancy pants next to all the other machines! My office is ALWAYS cold during the summer. I have a sweater I keep at work for that reason (I never need it in the winter!). It’s so annoying. I love A.C. but not when it’s blasting. I ALWAYS pee in the mid of the night! and if i dont.. then I end up dreaming about peeing! hah! 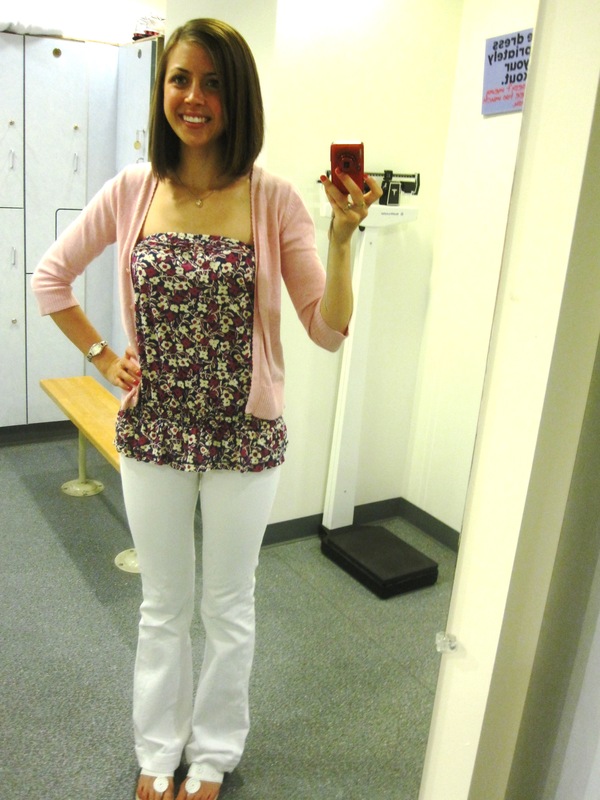 dang woman; i wish i could pull off white jeans/bottoms like you can! !